Lovely. I must steal it. I agree, its very bad that Zorita couldn't see it. But also bad that none of the other referees saw it clearly. Even Tamino missed the key point about the padding (and I'm just going with your flow; I did FFTs as an undergraduate and what you say *sounds* entirely plausible but I can't claim to have checked). Open discussion comments shown on the CotP website can be posted by anyone on a voluntary basis, so it's not necessarily the case that Zorita chose them, or even knew who they were. AIUI there is another round of reviews, after this initial open discussion phase, in which Zorita would select reviewers in his capacity as editor, but those reviews aren't posted. The discussion has contributions from people labelled Anonymous referee #1 and #2. I can't imagine that they just wrote in with those names. Zorita refers to the referees frequently in his message. AIUI the second round is basically where the editor and authors haggle, bringing in the referees as the editor wishes. Ah, yes, I see now they make a distinction between referee comments (RC) and short comments (SC). The former presumably selected, the latter open to all. That does mean Mudelsee was never an appointed referee, he was just posting a short comment in the open discussion as anyone is able to do. Anonymous referee #2 wasn't a replacement - he was probably invited to comment before Mudelsee posted anything, and indeed the first comment from each appeared on the same date. Looking at other dates, Zorita's comment was posted on 27 Nov 2012, the final paper says a revised paper was submitted on 20 Jan 2013 and was accepted 4 Feb 2013. That's not much time for a further round of reviews, particularly since the reviewers and Zorita himself seemed to be suggesting a complete do-over. Nick, do you have any plans to make this into a comment to the paper? I think some people need to be embarrassed (Zorita claimed the reviewers were experts in time series analysis; surely they should have noted the problems?). In their policy, the only mention of comments on papers is the interactive forum, which does seem to be the right place. But that's for a limited time. In their FAQ they explain why they don't have a category of "letters" or "short communications". In fact, Manfred wasn't official reviewer at any stage. In any case, thank you for this additional comment on the subject. Thanks, I hadn't seen that. It is a very interesting thread. I had inferred from some of Mudelsee's comments that he had had some reviewer status, but I see from the editor's view that he had declined. "There were a few more public comments on this manuscript, most of them critical. However, as editor, I could not consider all these comments as independent reviews, since all of them stemmed from commentators of Georg Hoffmann's blog. I have a strong opinion that reviews of a paper have to be independent." I see that you remarked on this too. So, the fairness of the process was maintained, and the truth died. It is the responsibility of the editor to find out whether the paper is actually right, not just to adjudicate a he siad/she said process. Anyway, I see that he did invite a rebuttal. James also had a bit of discussion on this article on his blog. Don't you think it's a bit of stretch though to suggest the truth "died"? Essentially everybody including the WUWT crowd is aware the paper is bad. The result you go here is a special case where the frequency of the signal is exactly centered in a bin, and on the use of a rectangular window. For observational data, it's essentially never going to be centered on a window. 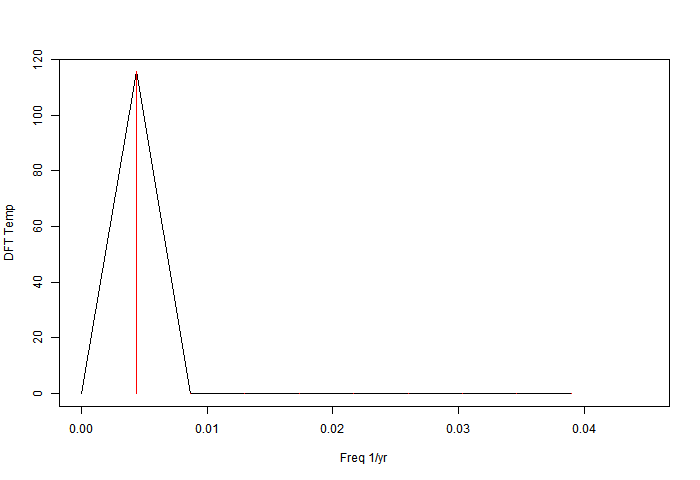 You'll guaranteed to get just one peak, but in general you'll have nonzero values for the other bins. Here's my version of the plot. When you zero-pad the data, the true window-response function is revealed, which for a rectangular window is just a sinc function of course. I recommend using rectangular, Welch, triangular, Hann and Blackman windows. "The truth died" - well, it's a play on "the operation was a success but the patient died". Focussing on process, while forgetting that the object of review is to find out whether the paper is sound. With the sinusoid example, I was trying to show that when padding shifts the peak location, it's due to overlapping sinc's. With the sinc function, because of the regular spacing the value at the peak doesn't change, because sincs from neighbor peaks have a zero there. So the red lines continue to touch the envelope. But they don't have a zero slope, so the peak shifts. Yes, I think padding with windowing might help a little, by reducing overlap. But the issue isn't really with the spread of the peaks; it's the peaks themselves and their misinterpretation. Nick, do you agree the peaks are artifacts of windowing? Changing the window function shifts the location of the secondary maxima in addition to changing the width of the primary maximum, so if the peaks are due to an artifact of windowing, going to Hann windowing would nail this. Today is Mother's Day in the US and I'm trying not to draw wife aggro, so I have to stop here! Do you have a link to the data that you actually used? here is a csv file of the annual averages of the 6 stations # HOH=14159; KRE=5226; MUN=14189; WIE=5238; PRA=13014; BER=14474. It starts 1701. It appears from from their figure they also subtracted the mean of the series... correct? I can't understand their rational for not detrending the data though. Nick thanks again for the link to the data. When I compute the spectra for the Hohenpeissenberg data (231 years), I get a very similar figure to Ludecke's Figure 3, in terms of the apparent spectral peaks in the data. I went back and did the test I suggested, namely compared rectangular to Welch and Hann windowing. It's very clear (to me anyway) that most of these other peaks are artifacts. I still get peaks for periods near 250 years and 35 years. My suspicion is the 250 year peak is just a windowing artifact associated with the non-zero trend in the data (it disappears if you e.g. quadratically detrend the data). I think that the labeled peaks in Ludecke's figure 3 are just windowing artifacts. Definition of Welch window here. There's a more formalized approach for testing the robustness of spectral peaks called the "multitaper method". There even seems to be an R-implementation. If you care to pursue this, you might get a publishable result from that. That sounds right about the 35 yr; with >6 periods, there's a good chance something can be said. I think the difficulty of separating lower frequencies from artefacts just reflects that there are two few periods to tell. 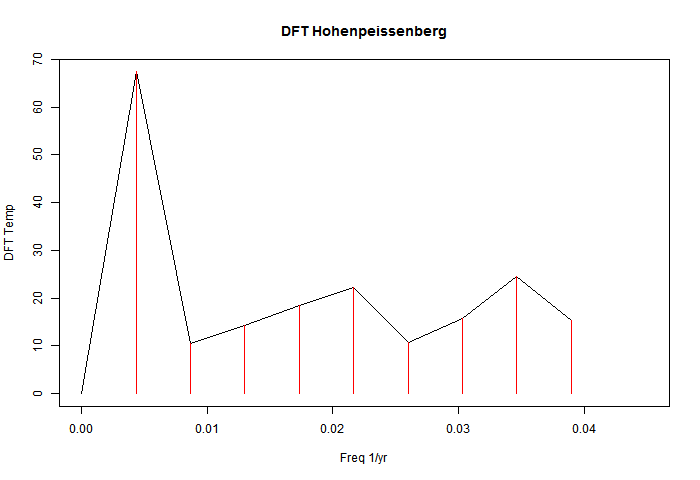 In effect, the DFT bins low frequencies. They have to go somewhere. I think your filters more efficiently push them into the lowest bin. I looked at the detrending used in Matlab - it's just OLS. I think this is not the right idea. If you think of sin(πx) from -1 to 1, it is very well handled by DFT. But it has an OLS trend, and if you subtract that, you get a mess. The idea of subtracting a trend is to make the residue more plausibly periodic, which really means continuous. I think the line to be subtracted needs to be chosen on that criterion. It should be a line joining some estimate of endpoint values, rather than OLS. "filters" I meant windows. I assume the red curve is Hann? Yes, agreement at 35 yr is good. Nick, regarding detrending... I don't think there's a lot more that you can do, unless you have a specific model for the origin of the secular component. it's pretty typical to detrend on a per-window basis (e.g. 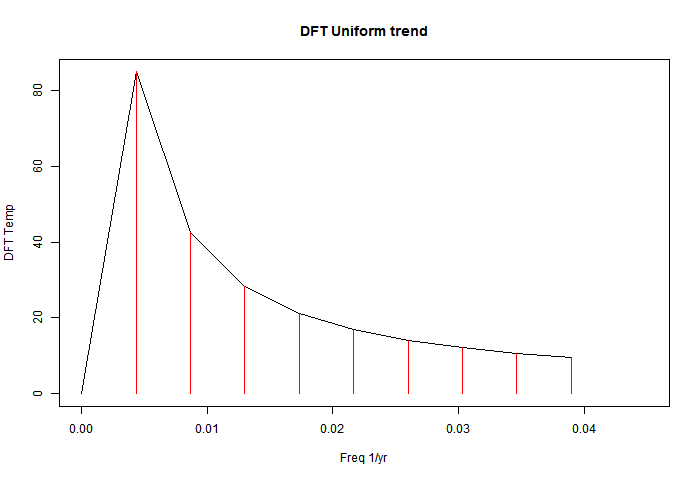 linear detrend) before computing the time series. Detrending the whole series with a polynomial is less optimal. In this case, you don't have a choice because there's so little data. Regarding this: I think the difficulty of separating lower frequencies from artefacts just reflects that there are two few periods to tell. [The problems with conventional Fourier analysis ] are often overcome by averaging over many realizations of the same event. However, this method is unreliable with small data sets and undesirable when one does not wish to attenuate signal components that vary across trials. Instead of ensemble averaging, the multitaper method reduces estimation bias by obtaining multiple independent estimates from the same sample. Each data taper is multiplied element-wise by the signal to provide a windowed trial from which one estimates the power at each component frequency. The technique I used above to vary the window (taper) function is similar in spirt, but Thomson went a step further by demonstrating that the discrete prolate spheroidal sequences of length "n" (window length) are independent of each other (as you know, by using orthogonal functions, the inversion of the OLS is both trivial and noiseless). It's a very elegant method, but like the Welch periodogram, it provides a mechanism for estimating confidence intervals. I really don't have any question that most of the spectral peaks in Ludecke's Figure 3 (left panel) are artifacts, but a formal method like this nails it. I've quartically detrended the data before computing the MTM PDF. Note that the spectral peak I surmised was real survives here.. it shifts to a bit longer period though --- 41 years versus 35. Regarding normalization... I should have stipulated that Matlab uses the same normalization. However, I checked to verify this. readdata is just my code to read in a two column ascii data file, nothing special there. The data file is here. Documentation for PMTM can be found here. Yes, the code is very simple. I'd worry a little about quartic detrending. The argument for lunear detrending is that it probably doesn't take out periodic signals (though in the sin example above, it does take out some). But by quartic, there is substantial opportunity to remove a periodic signal. Or put an other way, anbiguity about what is periodic and what secular. I've been trying different detrending. Now it's simpler; I just use weighted regression, emphasising the ends. cosh(yr/10) currently. The idea is that the residuals are close to zero near the ends; with quadratic. the gradient of residuals is near zero too. That makes a periodic fit more reasonable, and it's fairly continuous with zero padding. It works fairly well, and makes tapering less attractive. I'll post results later today (14th). Nick: Or put an other way, anbiguity about what is periodic and what secular. Yes I think this is always the case for very low frequency signals, but the ambiguity is intrinsic here. If the data really have a linear/quadratic/etc trend in it, the only "right way" to model it is as a linear/quadratic/etc tend + oscillatory terms. Higher order trends can mimic spectral peaks, via their window response function, as you showed here. It's harder (not impossible, but unlikely) for spectral peaks to mimic a trend, but it does require a special phase relationship among them to produce a trend from them. 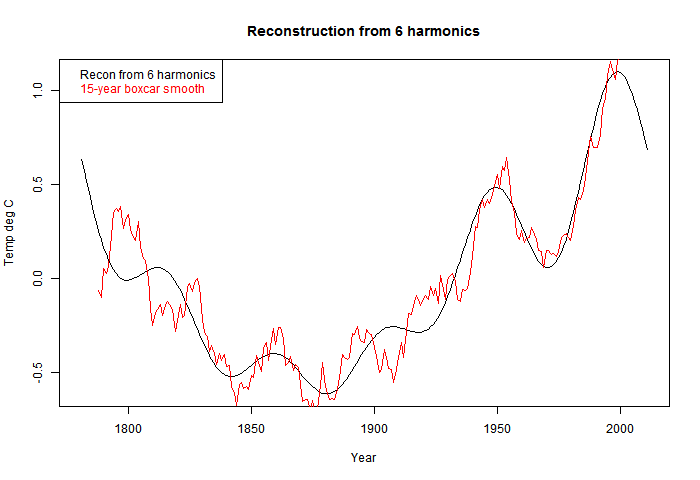 You can address the effect of detrending on estimation of spectral peaks, through a Monte Carlo, where you randomize the phase of the components and see how much effect the detrending has on them. Anyway, it'll be interesting to see what you come up with. Linear detrending still leaves what appears to be a large window response function from an apparent secular component in the original data. 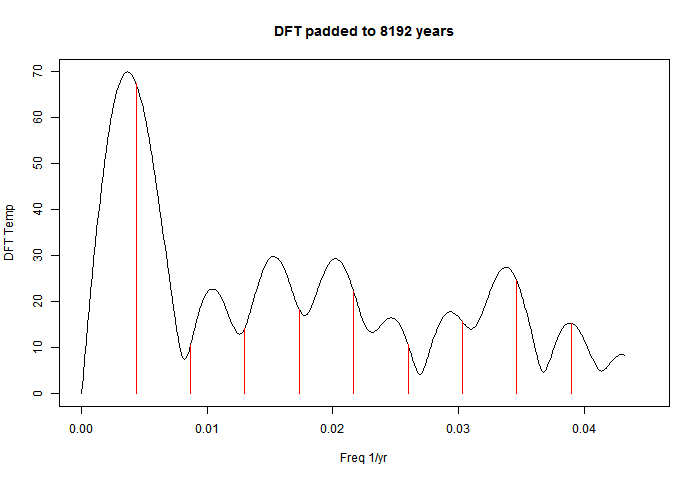 Quadratic detrending actually suppresses the measured response for frequencies below 0.015 yr^-1. Cubic and quartic give very similar results. 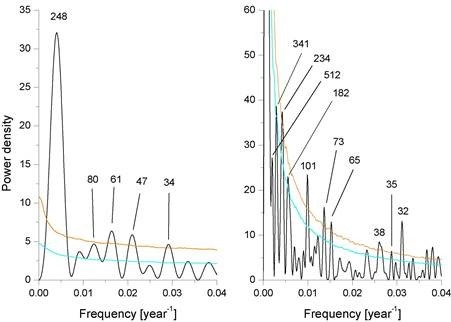 This suggests that the multitaper result for cubic and quartic gives the spectral peaks that are <i>unambiguously</i> associated with actual oscillatory components present in the actual signal over the measurement period. I am getting quite good results with weighted regression (cos((yr-meanyr)/10)) detrending. It leads to near continuity at the edges, and a non-zero mean. 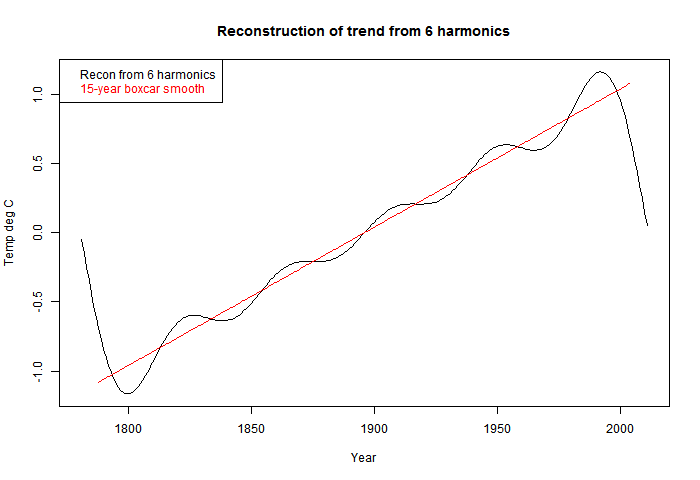 So there is a big zero peak which extends beyond the first harmonic, but other peaks are not very high. The 35 yr isn't robust. I've tried adding tapering, but it's a mixed blessing. It widens the central peak, and while I'm sure it is suppressing side lobes, they weren't so bad anyway. With weighted detrending, going to quadratic doesn't seem to help much. It's late here, so I won't try posting pictures, but probably in about eight hours I'll show something. Nothing is perfect, but there's no great pattern visible. I expanded the results file to cover weighted quadratic fit. I've lost faith in my weighting idea, though. It creates a big central value, being non-zero mean, and there's no real improvement to compensate. I think the 35-year peak is probably real, but has a fairly low signal-to-noise. I wouldn't write a paper featuring it though. The side-lobes are a bit of an issue in this case because Luedecke et al erroneously try to assign meaning to them. Changing the taper or detrending helps to demonstrate that these peaks are associated with the window response to the secular component. The benefits of the width of the central peak and the tail of the response function strongly depends on the the class of measurements you're taking. It's pretty rare where rectangular windows beat out other tapers, especially when you've detrended the data. MTM formalizes a method for separating out window-response artifacts from spectral features that are actually present in the signal. Because of the ambiguity problem between low-frequency oscillations versus secular terms, interpretation of the results in terms of origin (e.g. oscillatory versus drift) still remains. The conservative approach would be to "allow" as much of the low frequency structure be "eaten" by detrending as is reasonable, and assign the rest as plausibly associated with oscillatory behavior. Trying to construct a statistical forecast model using the low-frequency structure where an ambiguity of this sort exists is completely insane. Got distracted.... to clarify this, other than the 35-year peak, I think the other, longer period, peaks in Figure 3 are not real. No idea what you peeps are going on about but thought it might be interesting to note that 35 years is the average recurrence time for large volcanic eruptions in the Gao 2008 stratospheric aerosol series. There's fairly substantial variance (+/-28 years, 1 sd) so it could be coincidence. Here's my summary of what we've been on about. I've criticised a flawed attempt to extract information about low freq periodicities where there are only a few periods observed. Artefacts were not being separated from meaningful analysis. The question was, can this be done better. 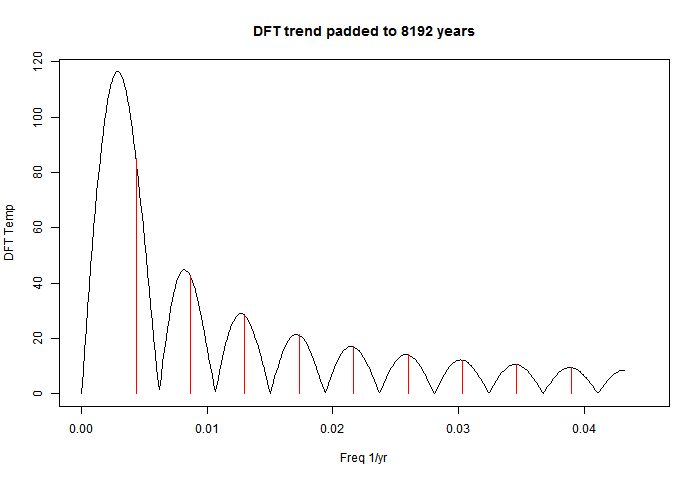 The problem shows clearest with the simple DFT. The low freq information is binned, one bin per harmonic. That limits resolution. But there's junk in the bins too. A big source is from the DFT trying to fit secular processes into a periodic frame. So the common suggestion is, de-trend. I played with a non-standard method, but on balance, it was not better. But de-trending is good. Then there's zero padding, which lets you try many more frequencies, and has some potential to show a sharp peak. 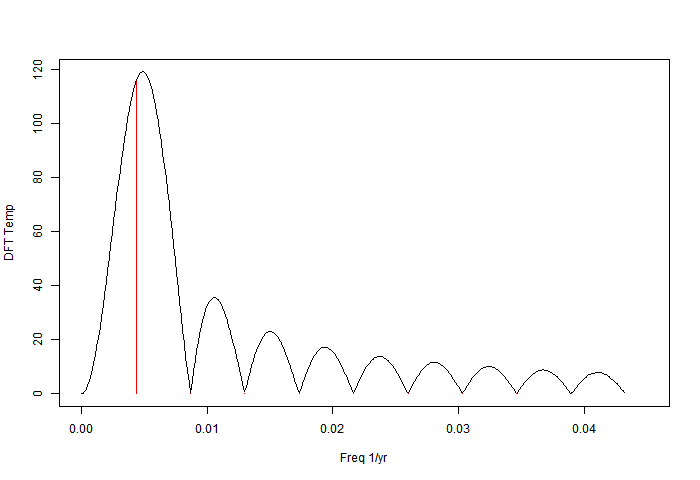 But not much, because each peak is convolved with a sinc function associated with the data length. This broadens the peak, and also produces side lobes, which push adjacent peaks off centre. Carrick suggests tapering. This suppresses side lobes, but broadens the centre. He also suggests multi-tapering, which gives varied views, which helps to decide what is real and what not. I've done a lot of playing, though not yet with systematic multi-tapering. I haven't found any low frequency that I think is robust, including 35 yr.
IEHO the problem was the reviewers were a) polite and b) not really appropriate. Now some (hi Steve), not Eli to be sure, would say that the fix was in given Zorita's connections to the Alpine climate groups. He had to know better. Hi, where did you find the numerical data for the stations in BEST? esp the ones that are corrected. I've put here an R binary file of the annual averaged data in a GHCNv2 type structure (6.8Mb), with an inventory file here.